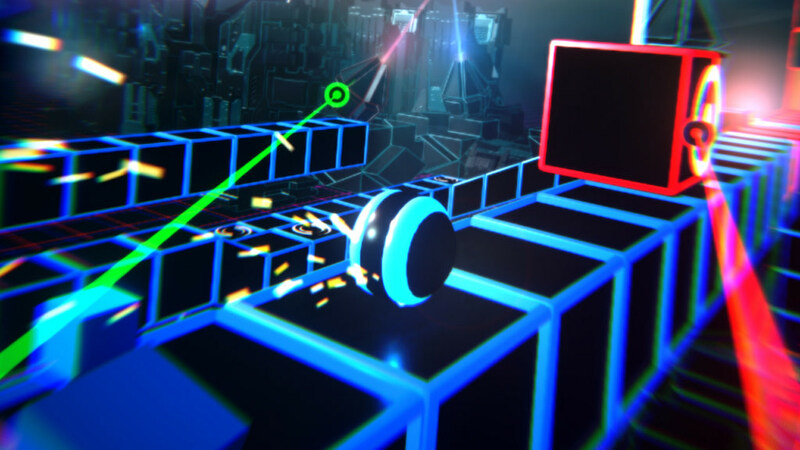 Neonwall is a game that is, quite literally, about a neon wall. It’s also a game that manages to feel remarkably different to anything else that is currently available on the Nintendo eShop for Nintendo Switch, even if this fluorescent-coloured physics puzzler doesn’t emerge unscathed in execution. After a lightning storm somehow manages to warp you inside a pinball machine, you awaken in a Tron-like neon world where an oversized blue pinball bleeps at you. Finding that you are now carrying a coloured laser gun in each hand, you must, without any real explanation as to the reason why, use them to help guide the lonely pinball to its intended destination. With the pinball rolling continuously ever forward, the laser guns that you now wield must be constantly used to change its colour. The neon wall along which it rolls is broken into different colours, and the mental challenge is to make sure that the pinball matches the colour that it is trundling over. Match colours and the pinball maintains pace, or otherwise, leave it be to risk it losing momentum. You will quickly come to rely on the L and R Buttons, which correspond to each laser gun that you carry that can store the leftover colours that haven’t been zapped into the pinball – neon red, blue, and green being those that you cycle between. With more than 30 levels to speed your way through, it isn’t long after you come to understand what is expected from you, that you are having to watch out for doors, bridges, or coloured blocks that you must blast away with a laser gun shot that matches their colour. The experience soon becomes a little more frantic, putting your skill, concentration, and coordination to the test as you work out how to overcome the obstacles that you are faced with. But, even given the game’s relative brevity, there’s a sense of detachment and lack of engagement with it all that will soon see you lose interest. You’re helping the pinball’s progression, but, for whatever reason, it’s hard to really care about what you are doing nor is it as entertaining as it could have been. It is difficult to explain precisely why that is, but, if I were to try to identify what could be to blame, it would be how slow the pinball trundles along and the lack of any danger or thrill. There are three games modes with which the developer, Norain Games, has looked to differentiate the experience, but none of them is able to summon that spark of excitement that’s needed to ever have the chance to win you over. The Puzzle mode is the standard approach and lets you complete levels in your own time, Time Trial challenges you to reach a level’s multiple checkpoints within a given time limit, and Runner grants you one life with which you must reach the level’s conclusion with the risk that if you muck up you will have to start over again. With support for Handheld, Tabletop, and TV Mode as we continue to expect, you can choose to play with your Joy-Con, Joy-Con Grip, or the Nintendo Switch Pro Controller. The developer has gone one step further than most to implement gyroscopic motion controls, but this is met with mixed results. You can usually nearly complete a single level without any problems, but there is a constant need to recalibrate the Joy-Con to make sure that you’re not having to make sweeping motions to get any response from your actions. Beneath the hue of its pulsating neon glow, Neonwall constructs itself around an interesting concept but struggles to find a way to make it as engaging as it needs to be. It will boggle your mind in ways unlike any other Nintendo eShop release, but lacks the staying power to maintain your attention for long beyond completion.